Parker, Nicholas T Ktistakis, Ann M Dixon, Judith Klein-Seetharaman, Susan Henry, Mark Christian Dirk Dormann, Gil-Soo Han, Stephen A Jesch, George M Carman, Valerian Kagan, et al. Maintenance of energy homeostasis depends on the highly regulated storage and release of triacylglycerol primarily in adipose tissue and excessive storage is a feature of common metabolic disorders. CIDEA is a lipid droplet (LD)-protein enriched in brown adipocytes promoting the enlargement of LDs which are dynamic, ubiquitous organelles specialized for storing neutral lipids. We demonstrate an essential role in this process for an amphipathic helix in CIDEA, which facilitates embedding in the LD phospholipid monolayer and binds phosphatidic acid (PA). LD pairs are docked by CIDEA trans-complexes through contributions of the N-terminal domain and a C-terminal dimerization region. These complexes, enriched at the LD-LD contact site, interact with the cone-shaped phospholipid PA and likely increase phospholipid barrier permeability, promoting LD fusion by transference of lipids. This physiological process is essential in adipocyte differentiation as well as serving to facilitate the tight coupling of lipolysis and lipogenesis in activated brown fat. Evolutionary pressures for survival in fluctuating environments that expose organisms to times of both feast and famine have selected for the ability to efficiently store and release energy in the form of triacyclglycerol (TAG). However, excessive or defective lipid storage is a key feature of common diseases such as diabetes, atherosclerosis and the metabolic syndrome (1). The organelles that are essential for storing and mobilizing intracellular fat are lipid droplets (LDs) (2). They constitute a unique cellular structure where a core of neutral lipids is stabilized in the hydrophilic cytosol by a phospholipid monolayer embedding LD-proteins. While most mammalian 46 cells present small LDs (<1 Pm) (3), white (unilocular) adipocytes contain a single giant LD occupying most of their cell volume. In contrast, brown (multilocular) adipocytes hold multiple LDs of lesser size, increasing the LD surface/volume ratio which facilitates the rapid consumption of lipids for adaptive thermogenesis (4). The exploration of new approaches for the treatment of metabolic disorders has been stimulated by the rediscovery of active brown adipose tissue (BAT) in adult humans (5, 6) and by the induction of multilocular brown-like cells in white adipose tissue (WAT) (7). The multilocular morphology of brown adipocytes is a defining characteristic of these cells along with expression of genes such as Ucp1. The acquisition of a unilocular or multilocular phenotype is likely to be controlled by the regulation of LD growth. Two related proteins, CIDEA and CIDEC promote LD enlargement in adipocytes (8-10), with CIDEA being specifically found in BAT. Together with CIDEB, they form the CIDE (cell death-inducing DFF45-like effector) family of LD-proteins, which have emerged as important metabolic regulators (11). Different mechanisms have been proposed for LD enlargement, including in situ neutral lipid synthesis, lipid uptake and LD-LD coalescence (12-14). The study of CIDE 62 proteins has revealed a critical role in the LD fusion process in which a donor LD progressively transfers its content to an acceptor LD until it is completely absorbed (15). However, the underlying mechanism by which CIDEC and CIDEA facilitate the interchange of triacylglycerol (TAG) molecules between LDs is not understood. In the present study, we have obtained a detailed picture of the different steps driving this LD enlargement process, which involves the stabilization of LD pairs, phospholipid binding, and the permeabilization of the LD monolayer to allow the transference of lipids. The Cidea gene is highly expressed in BAT, induced in WAT following cold exposure (46), and is widely used by researchers as a defining marker to discriminate brown or brite adipocytes from white adipocytes (7, 28). As evidence indicated a key role in the LD biology (47) we have characterized the mechanism by which CIDEA promotes LD enlargement, which involves the targeting of LDs, the docking of LD pairs and the transference of lipids between them. The lipid transfer step requires the interaction of CIDEA and PA through a cationic amphipathic helix. Independently of PA-binding, this helix is also responsible for anchoring CIDEA in the LD membrane. Finally, we demonstrate that the docking of LD pairs is driven by the formation of CIDEA complexes involving the N-term domain and a C-term interaction site. CIDE proteins appeared during vertebrate evolution by the combination of an ancestor N-term domain and a LD-binding C-term domain (35). In spite of this, the full process of LD enlargement can be induced in yeast by the sole exogenous expression of 395 CIDEA, indicating that in contrast to SNARE-triggered vesicle fusion, LD fusion by lipid transference does not require the coordination of multiple specific proteins (48). Whereas vesicle fusion implicates an intricate restructuring of the phospholipid bilayers, LD fusion is a spontaneous process that the cell has to prevent by tightly controlling their phospholipid composition (23). However, although phospholipid-modifying enzymes have been linked with the biogenesis of LDs (49, 50), the implication of phospholipids in physiologic LD fusion processes has not been previously described. Complete LD fusion by lipid transfer can last several hours, during which the participating LDs remain in contact. Our results indicate that both the N-term domain and a C-term dimerization site (aa 126-155) independently participate in the docking of LD pairs by forming trans interactions (Fig. 7). Certain mutations in the dimerization sites that do not eliminate the interaction result in a decrease on the TAG transference efficiency, reflected on the presence of small LDs docked to enlarged LDs. This suggests that in addition to stabilizing the LD-LD interaction, the correct conformation of the 409 CIDEA complexes is necessary for optimal TAG transfer. Furthermore, the formation of stable LD pairs is not sufficient to trigger LD fusion by lipid transfer. In fact, although LDs can be tightly packed in cultured adipocytes, no TAG transference across neighbour LDs is observed in the absence of CIDE proteins (15), showing that the phospholipid monolayer acts as a barrier impermeable to TAG. Our CG-MD simulations indicate that certain TAG molecules can escape the neutral lipid core of the LD and be integrated within the aliphatic chains of the phospholipid monolayer. This could be a transition state 416 prior to the TAG transference and our data indicates that the docking of the amphipathic helix in the LD membrane could facilitate this process. However, the infiltrated TAGs in LD membranes in the presence of mutant helices, or even in the absence of docking, suggests that this is not enough to complete the TAG transference. To be transferred to the adjacent LD, the TAGs integrated in the hydrophobic region of the LD membrane should cross the energy barrier defined by the phospholipid polar heads, and the interaction of CIDEA with PA could play a role in this process, as suggested by the disruption of LD enlargement by the mutations preventing PA-binding (K167E/R171E/R175E) and the inhibition of CIDEA after PA depletion. 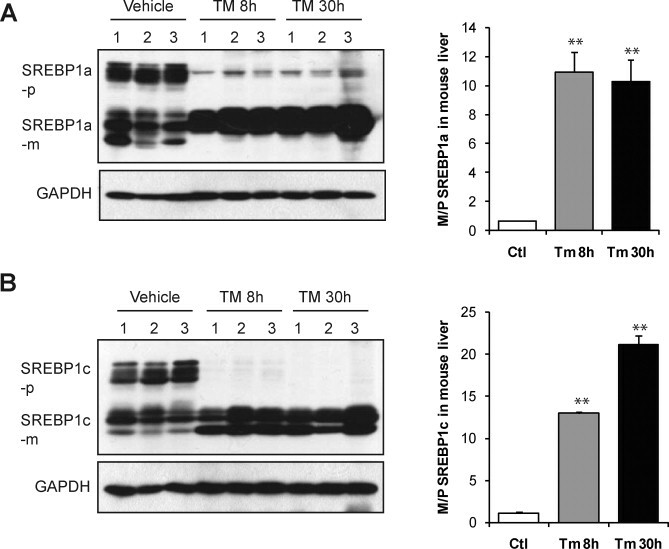 The minor effects observed with more conservative substitutions in the helix, suggests that the presence of positive charges is sufficient to induce TAG transference by attracting anionic phospholipids present in the LD membrane. PA, which requirement is indicated by our PA-depletion experiments, is a cone-shaped anionic phospholipid which could locally destabilize the LD monolayer by favoring a negative membrane curvature incompatible with the spherical LD morphology (51). Interestingly, while the zwitterion PC, the main component of the monolayer, stabilizes the LD structure (23), the negatively charged PA promote their coalescence (29). This is supported by our CD-MD results which resulted in a deformation of the LD shape by the addition of PA. We propose a model in which the C-term amphipathic helix positions itself in the LD monolayer and interacts with PA molecules in its vicinity, which might include trans interactions with PA in the adjacent LD. The interaction with PA disturbs the integrity of the phospholipid barrier at the LD-LD interface, allowing the LD to LD transference of TAG molecules integrated in the LD membrane (Fig. 7). Additional alterations in the LD composition could be facilitating TAG transference, as differentiating adipocytes experience a reduction in saturated fatty acids in the LD phospholipids (52), and in their PC/PE ratio (53) which could increase the permeability of the LD membranes, and we previously observed that a change in the molecular structures of TAG results in an altered migration pattern to the LD surface (32). During LD fusion by lipid transfer, the pressure gradient experienced by LDs favors TAG flux from small to large LDs (15). However, the implication of PA, a minor component of the LD membrane, could represent a control mechanism, as it is plausible that the cell could actively influence the TAG flux direction by differently regulating the levels of PA in large and small LDs, which could be controlled by the activity of enzymes such as AGPAT3 and LIPIN-1J (13, 30). This is a remarkable possibility, as a switch in the favored TAG flux direction could promote the acquisition of a multilocular phenotype and facilitate the browning of WAT (24). Interestingly, Cidea mRNA is the LD protein- encoding transcript that experiences the greatest increase during the cold-induced process by which multilocular BAT-like cells appear in WAT (24). Furthermore, in BAT, cold exposure instigates a profound increase in CIDEA protein levels that is independent of transcriptional regulation (54). The profound increase in CIDEA is coincident with elevated lipolysis and de novo lipogenesis that occurs in both brown and white adipose tissues after E-adrenergic receptor activation (55). It is likely that CIDEA has a central role in coupling these processes to package newly synthesized TAG in LDs for subsequent lipolysis and fatty acid oxidation. Importantly, BAT displays high levels of glycerol kinase activity (56, 57) that facilitates glycerol recycling rather than release into the blood stream, following induction of lipolysis (58), which occurs in WAT. Hence, the reported elevated glycerol released from cells depleted of CIDEA (28) is likely to be a result of decoupling lipolysis from the ability to efficiently store the products of lipogenesis in LDs and therefore producing a net increase in detected extracellular glycerol. This important role of CIDEA is supported by the marked depletion of TAG in the BAT of Cidea null mice following overnight exposure to 4 °C (28) and our findings that CIDEA-dependent LD enlargement is maintained in a lipase negative yeast strain. Cidea and the genes that are required to facilitate high rates of lipolysis and lipogenesis are associated with the “browning” of white fat either following cold exposure (46) or in genetic models such as RIP140 knockout WAT (59). The induction of a brown- like phenotype in WAT has potential benefits in the treatment and prevention of metabolic disorders (60). Differences in the activity and regulation of CIDEC and CIDEA could also be responsible for the adoption of unilocular or multilocular phenotypes. In addition to their differential interaction with PLIN1 and 5, we have observed that CIDEC is more resilient to the deletion of the N-term than CIDEA, indicating that it may be less sensitive to regulatory posttranslational modifications of this domain. This robustness of CIDEC activity together with its potentiation by PLIN1, could facilitate the continuity of the LD enlargement in white adipocytes until the unilocular phenotype is achieved. In contrast, in brown adipocytes expressing CIDEA the process would be stopped at the multilocular stage for example due to post-translational modifications that modulate the function or stability of the protein or alteration of the PA levels in LDs. 1. 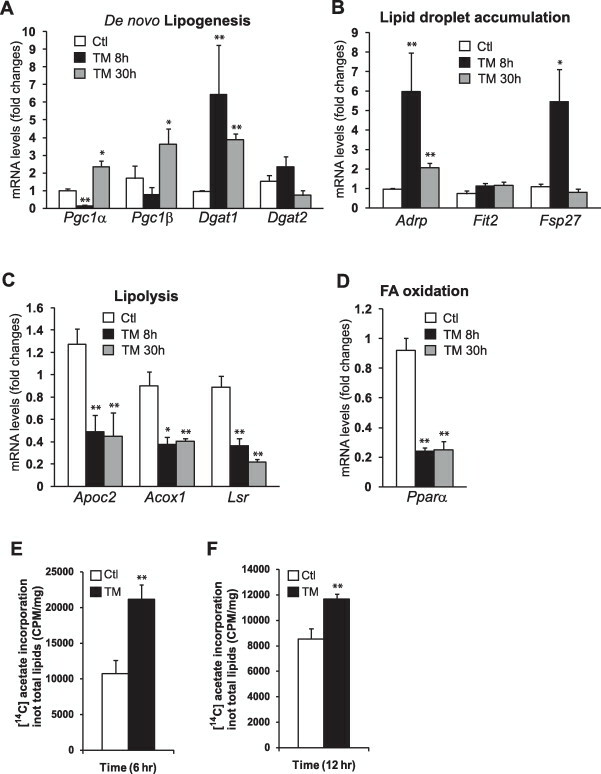 Absence of adipose triglyceride lipase protects from hepatic endoplasmic reticulum stress in mice. Fuchs CD, Claudel T, Kumari P, Haemmerle G, et al. LabExpMol Hepatology, Medical Univ of Graz, Austria. Hepatology. 2012 Jul;56(1):270-80. http://dx.doi.org/10.1002/hep.25601. Epub 2012 May 29.
could protect against hepatic ER stress. were challenged with tunicamycin (TM) to induce ER stress. after the knockdown of ATGL before FA and TM treatment. which displayed strongly reduced serum VLDL cholesterol levels. inflammatory markers Tnfα and iNos. Total hepatic FA profiling revealed a higher palmitic acid/oleic acid (PA/OA) ratio in WT mice. was increased in TM-treated WT mice only. to target ER stress in NAFLD. PMID: 22271167 Diabetes Obes Metab. 2010 Oct;12 Suppl 2:83-92. 2. Hepatic steatosis: a role for de novo lipogenesis and the transcription factor SREBP-1c. Excessive availability of plasma fatty acids and lipid synthesis from glucose (lipogenesis) are important determinants of steatosis. insulin and carbohydrate response element binding protein (ChREBP) activated by glucose. Insulin induces the maturation of SREBP-1c in the endoplasmic reticulum (ER). lipogenic genes in conjunction with ChREBP. Lipogenesis activation in the liver of obese markedly insulin-resistant steatotic rodents is then paradoxical. secondary in the steatotic liver to an ER stress. improves markedly hepatic steatosis and insulin sensitivity. ER is thus worth considering as a potential therapeutic target for steatosis and metabolic syndrome. Inserm, Centre de Recherches Biomédicales des Cordeliers, Paris, France. Insulin has long-term effects on glucose and lipid metabolism through its control on the expression of specific genes. which requires post-translational modification to yield its transcriptionally active nuclear form. can be considered as a thrifty gene. has been considered in genetic studies. INSERM, Centre de Recherches des Cordeliers and Université Pierre et Marie Curie-Paris, Paris, France. glucose metabolism in conjunction with ChREBP. explaining the stimulation of lipogenesis in an insulin-resistant liver. hepatic steatosis and insulin sensitivity. Jin-Sook Leea, Ze Zhenga, R Mendeza, Seung-Wook Hac, et al. associated with the initiation and progression of a variety of diseases. promotes NASH in an animal model. was dramatically increased in the liver. in the liver of mice challenged with TM. leading to the activation of NF-κB-mediated inflammatory pathway in the liver. inflammation in the liver in vivo. ► Pharmacologic ER stress induced by tunicamycin (TM) induces a quick NASH state in vivo. ► TM leads to dramatic increase in cleavage of sterol regulatory element-binding protein in the liver. ► TM up-regulates lipogenic genes, but down-regulates the genes in lipolysis and FA oxidation. ► TM activates NF-κB and expression of genes encoding pro-inflammatory cytokines in the liver. Fig. 1. 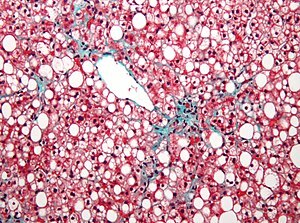 TM challenge alters lipid profiles and causes hepatic steatosis in mice. (A) Quantitative real-time RT-PCR analysis of liver mRNA isolated from mice challenged with TM or vehicle control. Total liver mRNA was isolated at 8 h or 30 h after injection with vehicle or TM (2 μg/g body weight) for real-time RT-PCR analysis. Expression values were normalized to β-actin mRNA levels. 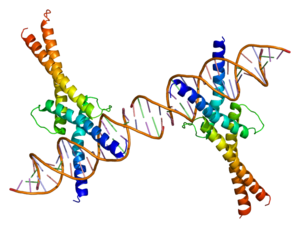 Fold changes of mRNA are shown by comparing to one of the control mice. Each bar denotes the mean ± SEM (n = 4 mice per group); **P < 0.01. Edem1, ER degradation enhancing, mannosidase alpha-like 1. (B) Oil-red O staining of lipid droplets in the livers of the mice challenged with TM or vehicle control (magnification: 200×). (C) Levels of TG in the liver tissues of the mice challenged with TM or vehicle control. (D) Levels of plasma lipids in the mice challenged with TM or vehicle control. TG, triglycerides; TC, total plasma cholesterol; HDL, high-density lipoproteins; VLDL/LDL, very low and low density lipoproteins. For C and D, each bar denotes mean ± SEM (n = 4 mice per group); *P < 0.05; **P < 0.01. Fig. 2. TM challenge leads to a quick NASH state in mice. (A) Histological examination of liver tissue sections of the mice challenged with TM (2 μg/g body weight) or vehicle control. Upper panel, hematoxylin–eosin (H&E) staining of liver tissue sections; the lower panel, Sirius staining of collagen deposition of liver tissue sections (magnification: 200×). (B) Histological scoring for NASH activities in the livers of the mice treated with TM or vehicle control. The grade scores were calculated based on the scores of steatosis, hepatocyte ballooning, lobular and portal inflammation, and Mallory bodies. The stage scores were based on the liver fibrosis. Number of mice examined is given in parentheses. Mean ± SEM values are shown. P-values were calculated by Mann–Whitney U-test. Fig. 3. TM challenge significantly increases levels of cleaved/activated forms of SREBP1a and SREBP1c in the liver. Western blot analysis of protein levels of SREBP1a (A) and SREBP1c (B) in the liver tissues from the mice challenged with TM (2 μg/g body weight) or vehicle control. Levels of GAPDH were included as internal controls. For A and B, the values below the gels represent the ratios of mature/cleaved SREBP signal intensities to that of SREBP precursors. The graph beside the images showed the ratios of mature/cleaved SREBP to precursor SREBP in the liver of mice challenged with TM or vehicle. The protein signal intensities shown by Western blot analysis were quantified by NIH imageJ software. Each bar represents the mean ± SEM (n = 3 mice per group); **P < 0.01. SREBP-p, SREBP precursor; SREBP-m, mature/cleaved SREBP. Fig. 4. TM challenge up-regulates expression of genes involved in lipogenesis but down-regulates expression of genes involved in lipolysis and FA oxidation. Quantitative real-time RT-PCR analysis of liver mRNAs isolated from the mice challenged with TM (2 μg/g body weight) or vehicle control, which encode regulators or enzymes in: (A) de novo lipogenesis: PGC1α, PGC1β, DGAT1 and DGAT2; (B) lipid droplet production: ADRP, FIT2, and FSP27; (C) lipolysis: ApoC2, Acox1, and LSR; and (D) FA oxidation: PPARα. Expression values were normalized to β-actin mRNA levels. Fold changes of mRNA are shown by comparing to one of the control mice. Each bar denotes the mean ± SEM (n = 4 mice per group); **P < 0.01. (E and F) Isotope tracing analysis of hepatic de novo lipogenesis. Huh7 cells were incubated with [1-14C] acetic acid for 6 h (E) or 12 h (F) in the presence or absence of TM (20 μg/ml). The rates of de novo lipogenesis were quantified by determining the amounts of [1-14C]-labeled acetic acid incorporated into total cellular lipids after normalization to cell numbers. Fig. 5. TM activates the inflammatory pathway through NF-κB, but not JNK, in the liver. 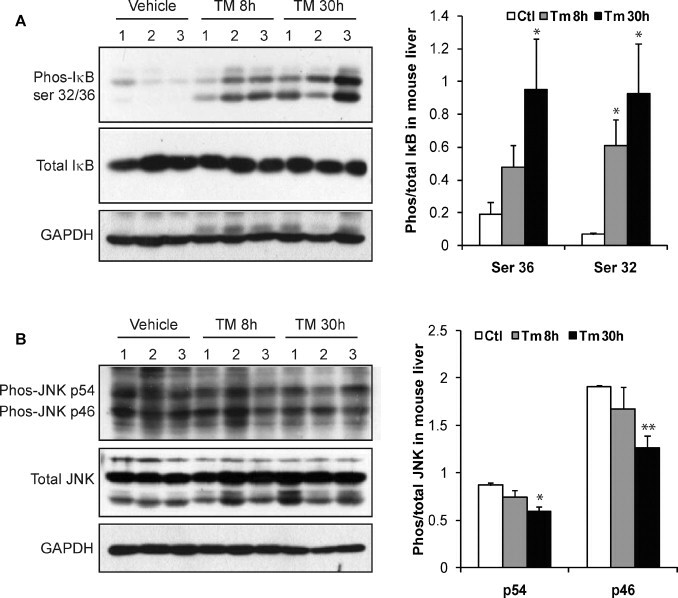 Western blot analysis of phosphorylated Iκ-B, total Iκ-B, phosphorylated JNK, and total JNK in the liver tissues from the mice challenged with TM (2 μg/g body weight) or vehicle control. Levels of GAPDH were included as internal controls. The values below the gels represent the ratios of phosphorylated protein signal intensities to that of total proteins. Fig. 6. 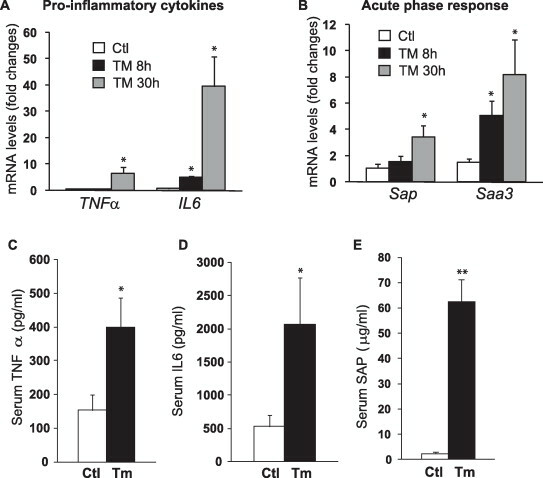 TM induces expression of pro-inflammatory cytokines and acute-phase responsive proteins in the liver. Quantitative real-time RT-PCR analyses of liver mRNAs isolated from the mice challenged with TM (2 μg/g body weight) or vehicle control, which encode: (A) pro-inflammatory cytokine TNFα and IL6; and (B) acute-phase protein SAP and SAA3. Expression values were normalized to β-actin mRNA levels. Fold changes of mRNA are shown by comparing to one of the control mice. 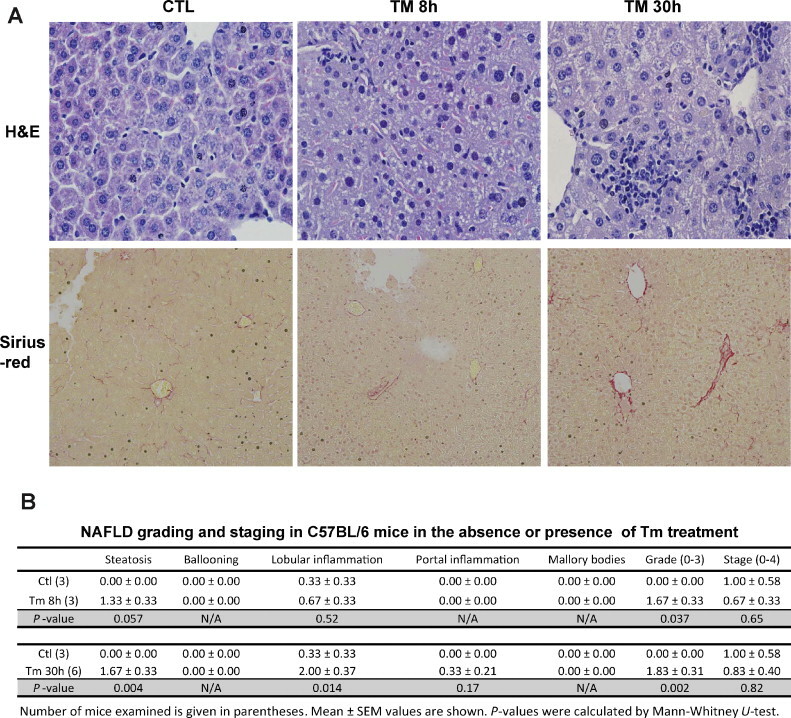 (C–E) ELISA analyses of serum levels of TNFα, IL6, and SAP in the mice challenged with TM or vehicle control for 8 h ELISA. Each bar denotes the mean ± SEM (n = 4 mice per group); *P < 0.05, **P < 0.01. Corresponding author at: Center for Molecular Medicine and Genetics, Wayne State University School of Medicine, 540 E. Canfield Avenue, Detroit, MI 48201, USA. Tel. : +1 313 577 2669; fax: +1 313 577 5218.